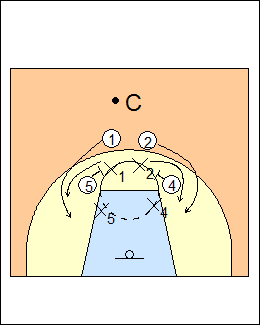 1 and 2 come off flare screens at the same time, to the basket. X1 and X2 chase over the screens, X4 and X5 are in line with the screeners so they don't get slipped to the basket. Every time we are beating a screen, we have to get below his hip. 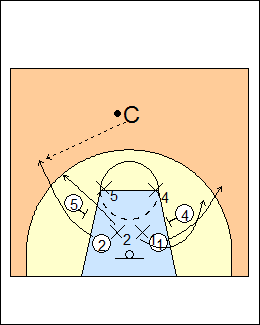 1 screens for 2, 5 and 4 wheel out into a single-double. X4 and X5 are in the gaps, extending the screens. X5 and X4 have to allow a "two-way go", X2 and X1 can chase or use a gap (shown for X2). 1 and 2 come off, it's live, get into some ballscreens, they're going to be in "black" any time it's not 5-on-5, switch any ballscreen or dribble hand-off. Progression - 5 on 5. 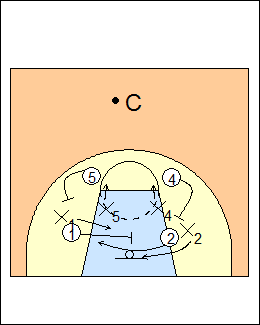 See Defence - Woodley ballscreens, Pitt off-ball screens, Messina off-ball screens, Defending off-ball screens.